Sharks, alligators, and panthers are just a few living things that come to mind when we think “Florida predator.” However, the state’s swamps are home to another kind of carnivore. Pitcher plants, named for their pitcher-like shape, thrive in flooded plains of North Florida, into coastal Georgia and South Carolina. The constantly flooded soil lacks nitrogen that’s a vital nutrient for plant growth. 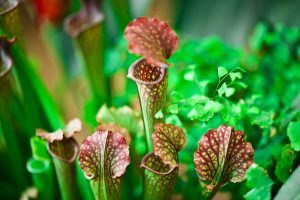 While the pitcher plant can photosynthesize to create its own food, it needed to find a way to get necessary nitrogen. The solution? Insects! The base of the pitcher plant’s “pitcher” is filled with a sweet-smelling nectar. 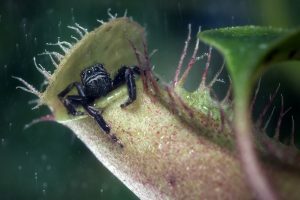 Hungry insects attracted to the nectar land on the edge of the pitcher, voluntarily following the smell or sliding down the plant’s waxy slope. Once inside, it’s all over for the little bug. Short hair-like structures along the plant’s wall point downward and guide the insect further in to the belly of the beast. Pitcher plants also developed lighter coloration at their base, tricking the insect’s compound eyes into thinking they’re crawling toward the light, and their escape. A pool of digestive enzymes awaits the trapped insects. As it gets digested, the insect will provide nitrogen for the pitcher plant to grow. Despite this unique adaptation, these fascinating plants bloom in spring just like other flowering plants across the region. April and May are great times to get out to northern Florida’s bogs, swamps, and flooded forests to see the brilliantly-colored flowers. Learn more about Florida’s native pitcher plants at this UF|IFAS website.